Product information "7-Fold Shantung Grenadine Tie - Chocolate / Brown / Beige"
Striped ties are among the absolute classics; here we have a version in summery shantung silk. 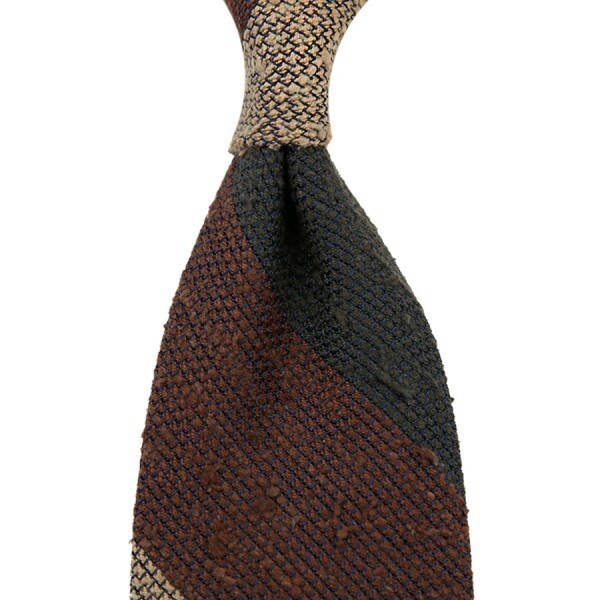 Wear it with a light grey suit, berry bamboo braces, green pocket square and suede derbies: this tie nearly always works. Sevenfolds are the the pinnacle of craftsmanship and the dream of every tie aficionado. The difference between Shibumi sevenfolds and almost every other tie is that there is no lining. So the tie just consists of the upper silk (and thread, of course), folded inwards seven times to give the tie the necessary volume. This construction method is very puristic and elegant, but at the same time luxuriously lavish. Related links to "7-Fold Shantung Grenadine Tie - Chocolate / Brown / Beige"